The labyrinth committee researched and experienced walking different types of labyrinth designs. We decided to create our labyrinth based on the Christian Chartres Cathedral design found in the gothic cathedral of Chartres which is located outside of Paris, France. This classic design has 11 circuits—concentric circles—with the 12th circle being the center with the rosette pattern. This design was created in the 12 Century. One of the commitments a Christian made at that time was to journey to Jerusalem and experience the path that Jesus walked. During this time, the Crusades were happening, making it almost impossible for the Christian to go to Jerusalem. The Bishops at that time, decided to create labyrinths in the major cathedrals in Europe. 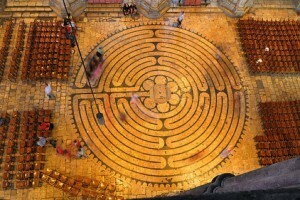 This would allow Christians to symbolically journey to the “New Jerusalem” which would be the center of the labyrinth. From a contemporary perspective, this design’s energy causes one to calm, to focus inward as one walks the labyrinth as a meditative walk. Other design’s energy do the opposite—energize and “rev up”. The 11 circuit design welcomes us to experience an inner spiritual process of releasing and letting go of our every day “stuff;” receiving guidance, insight, inner peace; and then returning to the world.